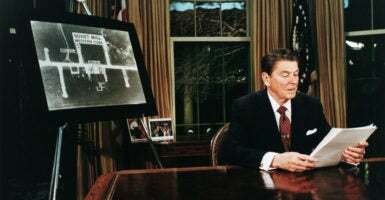 The Pentagon commemorated the 36th anniversary of President Ronald Reagan’s Strategic Defense Initiative in dramatic fashion March 25 by reaching a new technological milestone. The test March 25 validates the wisdom of his vision born from the Strategic Defense Initiative program. The Ground-Based Midcourse Defense system is currently the only system protecting the United States against long-range ballistic missiles, such as those that North Korea periodically threatens to use against us. The test involved a simulated intercontinental-range ballistic missile target and two Ground-Based Midcourse Defense interceptors.